Seeing a film in IMAX can alert a viewer to background details that you might not notice on your computer or even a standard movie screen, including incorrect outfits on superhero toys. When asked about non-canonical outfits on background merchandising, Shazam! director David F. Sandberg joked about the discrepancy motivating the sequel's plot. Over on Twitter, one fan shared screenshots of a Superman toy and a Batman backpack. These toys feature outfits that more closely resemble their comic book costumes which are quite different from the outfits they wear in the DC Extended Universe. This caused the fan to hypothesize that the new film doesn't take place in the same universe as the rest of the films. 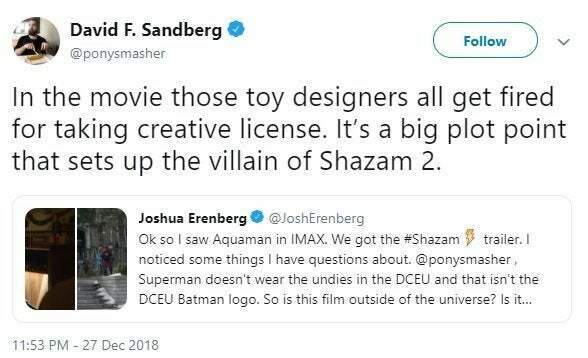 Sandberg jokingly replied, "In the movie those toy designers all get fired for taking creative license. It’s a big plot point that sets up the villain of Shazam 2." While the substitution of familiar logos understandably inspires some questions, it wouldn't be the first time the DCEU has shown more comics-accurate color schemes and logos. In Suicide Squad, for example, a vendor is seen selling Superman and Batman t-shirts that look like their comic book counterparts. The explanation is likely more closely in line with the reasons these characters undergo design changes in comic books, which is that various designers would stylize these logos and color schemes as they saw fit. This isn't the only time Sandberg has teased fans about the new film and its costumes, having previously joked that main character Billy Batson would borrow an outfit from another hero. When a fan asked if Batson would get various costumes in the new film, Sandberg replied, "Yeah, sometimes he wears Aquaman’s suit. It was a late addition but after seeing the Chinese box office numbers it was the right thing to do." In the film, "We all have a superhero inside us, it just takes a bit of magic to bring it out. In Billy Batson’s (Asher Angel) case, by shouting out one word—SHAZAM!—this streetwise 14-year-old foster kid can turn into the adult Super Hero Shazam (Zachary Levi), courtesy of an ancient wizard (Djimon Hounsou). Still a kid at heart—inside a ripped, godlike body—Shazam revels in this adult version of himself by doing what any teen would do with superpowers: have fun with them! Can he fly? Does he have X-ray vision? Can he shoot lightning out of his hands? Can he skip his social studies test? Shazam sets out to test the limits of his abilities with the joyful recklessness of a child. But he’ll need to master these powers quickly in order to fight the deadly forces of evil controlled by Dr. Thaddeus Sivana (Mark Strong)." Shazam! lands in theaters on April 5, 2019. Stay tuned for details about Batman and Superman's future in the DCEU.